Credit/Library of Congress, Motion Picture, Broadcasting, and Recorded Sound Division. FIfty years ago, one of the earliest known American Gay Pride demonstrations was held at Independence Hall in Philadelphia. At the "Reminder Day Picket" on July 4, 1968, demonstrators held signs reading "First Class Citizens for Homosexuals" and "End Discrimination Policies for Homosexuals." The Library of Congress has unveiled its new National Screening Room, which contains hundreds of films available to be watched and downloaded for free. The collection includes digitized historic films, commercials, newsreels and other recorded clips from 1890 through 1999, according to the New York Times. 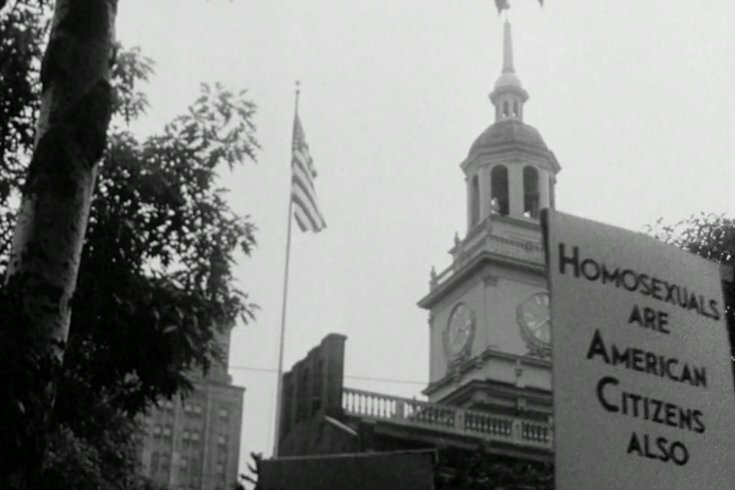 Footage from one of the earliest known American Gay Pride demonstrations on July 4, 1968 known as the "Reminder Day Picket" shows demonstrators holding signs that say "First Class Citizens for Homosexuals" and "End Discrimination Policies for Homosexuals" near Independence Hall in Philadelphia. Parade, 50th anniversary, Atlantic City, N.J.
Take a second to picture Atlantic City today. Now, here's footage of the 50th anniversary parade of the city from 1904. (That makes Atlantic City 164 years old this year.) You can see old floats, the U.S. Army Drum and Bugle Corps, and some members of the Atlantic City Fire Department. Westinghouse was founded in 1886 by George Westinghouse, who was the inventor of the air brake. The company was a leader at the time in alternating-current electronic systems. It became a major supplier to the electric utility industry with its line of machinery and products to generate, transmit, distribute and control electricity, according to Britannica. Below are a few different clips of the Pittsburgh flagship company and manufacturing center. First, rows of women are at tables using winding machines. According to the Library of Congress, they would wind using material from spools behind them, and then put the finished products in front of them. Below a group of men work on various parts of a large generator, assembling the pieces. A crane carries a large piece of the generator and the men guide it to where it should be placed. A camera gives a panoramic view of a machinery room by attaching itself to an overhead cane. You can see cranes moving, men hammering various things, and machinery passing by.